WeCollect is a leading China payment specialist focused on linking international merchants and PSP’s to the fast-growing Chinese consumer and B2B markets. With our ground-breaking hub technology, we enable merchants to centralize payment options into a single hub and drive higher conversations and lower cost by optimizing processing flow. WeCollect is a full service China payments provider offering payment processing, real-time cross-border remittances, subscription e-commerce, and China UnionPay prepaid cards. As your China payment specialist, outsourcing to us simplifies your operations and makes a difficult process easy and more efficient. In today’s competitive environment, companies need solutions which have tailor-made functionality built to serve industry verticals. At WeCollect, we have developed unique solutions to serve the below markets. Sophisticated payment management solutions including daily settlement, full and partial refunds and remittance services. Already integrated into major GDS systems enables quick and easy access to all our payment methods. Accept China UnionPay now. Quick and easy integration with built in fraud management functions allows you to accept multiple China payment methods used by 95% of the Chinese consumer. Open your target market to the Chinese consumer by allowing subscription processing of major China payment methods. Ability to establish recurring payments for multiple ecommerce applications such as insurance, content, and any pre-approved business model. In-bound and out-bound cross border remittances available to meet your companies payment needs. WeCollect is a China payment specialist focused on linking international merchants and PSP’s to the fast-growing Chinese consumer and B2B markets. Our ground breaking Orchestration Hub Technology enables merchants to lower integration costs via a single hub, and to improve conversations by optimizing their vendor and fraud management and streamlining processing flow. Founded by industry veterans and backed by blue-chip investors including global conglomerate Henyep Group, we provide our clients with state-of-the-art payment technologies and services which enable multiple China payment methods, inbound / outbound cross-border remittances, prepaid cards and more. We have a localized knowledge of the China payment market and our solutions are specifically designed to meet the needs of both general ecommerce as well as targeted industry verticals which require specific needs. Our singular focus is to provide efficient and feature-rich payment solutions specific to Chinese electronic and mobile commerce. Contact us to find out more. WeCollect’s China payments solution allows both merchants and PSP’s to integrate into all major China payment methods via a single integration into the WeCollect Hub. Start accepting payments from China UnionPay, and others. What’s more? We allow you to tailor your solution to your specific needs. Both WeCollect and white label cards available in major currencies. WeCollect provides unrivaled access to the China UnionPay network and other China specific payment methods via our China solution, which support all major debit, credit, and bank cards issued by over 200 banks in China plus e-wallet companies providing blanket coverage of a large percentage of Chinese consumers. We provide full front end and back end processing services including authorization, confirmation, settlement, and remittance of collected funds to merchants. Unique solutions including China UnionPay card issuing services complete a full-service offering. As your China payment specialist, outsourcing this to WeCollect simplifies your operations and makes a usually difficult process easy and more efficient. Our solution has been tried and tested to meet the needs of both small and large enterprises so no matter the complexity of your needs we can tailor a solution to meet your needs. At WeCollect, we assist payment processing companies connect to the China payment methods by providing access to China UnionPay and other popular options. As the China market continues to grow the consumption of international goods and services has skyrocketed. We add value to your payment solutions by expanding your geographic scope and increasing the value you provide to your merchant customers. Whether you are for the first time looking to integrate China payment methods to your current offering or simply looking to diversify your current options, WeCollect provides industry leading competitive rates and a full scope of services to meet your needs. WeCollect also provides solutions to other Asian payment methods including bank transfer and other alternative payment options across the Asia-Pacific. For more information about these services please contact us. Utilize our WeCollect Hub to connect directly into over 1,000 different payment options globally from a single integration. Use our powerful Orchestration Technology to plan when you use each vendor. This enables you to optimize performance and plan cost effectively. Companies are overloaded by the time and costs of establishing these mission-critical connections and this does not include the complexity of when to best use them. The Solution – WeCollect’s Payment Hub. Uniquely customized to suit our needs and powered by the award-winning Alpha Payments Cloud, one single integration provides access to over 1000 of the world’s top vendors and its easy-to-use orchestration tools allow “when, then, else” logic to customize for EVERY unique need you have in both your payments flow as well as your fraud vendors. A full functioning PCI DSS Level 1 v.3 compliant technology hub which integrates a gateway, orchestration layer, and reporting engine all into one. Provides access to multiple financial institutions via a single integration, pre-integrated into all major China payment methods including China UnionPay , plus more. Sophisticated and flexible payments management services including traffic management, control of transaction frequency, settlement in multiple currencies, refunds, remittance solution, and CUP prepaid card issuing. All fraud tools are not created equal. Our Hub’s multi-vendor fraud switching engine enables the use of each fraud tool only when the circumstance and cost scenario merits it. Cybersource, Threatmetrics, Maxmind + more are all integrated. State of the art web-based back office with easy to use UI. Complete reporting suite and API’s which enable complete control and flexibility in your reporting needs. Save IT resources by Integrating once into our WeCollect Hub which is connected to multiple China payment methods. Also take advantage of traffic management functionality to increase efficiency. WeCollect provides a real-time, omni-channel China focused payment solution that delivers fast and reliable payment processing in a secure environment coupled with world class fraud & risk management. The solution is easy to implement, integrate and manage. It is highly resilient, scalable & has the flexibility to expand with our partners and their end-customers. With over 5 billion China Partners cards now in circulation there exists a huge opportunity for companies as many International merchants still do not offer CUP at checkout. Our well established Partner Program allows you to add CUP to your product offering which enables you to differentiate your payment services and revenue streams and strengthen your merchant relationships by extending your business into new markets. WeCollect has an easy to integrate state-of-the-art gateway and a professional customer service partnership team which will assist you in the partnership implementation. Contact us today to learn more about our services and how you can add China payments to your offering. Chinese e-commerce transactions are slated to grow to a massive US$540 billion by 2015 eclipsing the USA as the largest e-commerce market in the world. Of this huge number and increasingly large portion of Chinese consumers are expected to make cross-border purchases in the nature of US$23 billion in 2014, representing an 81% increase over 2013. With this growth expected to continue at a fast pace, online merchants and payment processing companies will need to add China payment capabilities to their websites and gateways. In the near future China UnionPay (CUP) will be just as important as Visa and Mastercard. The number of e-commerce users in China is expected to reach over 300 million in 2015 and an increasingly larger percentage are transacting internationally through different services. WeCollect enables merchants to access this growing population of Chinese by providing familiar payment options at checkout. Complement your business today with the ability to accept such major China debit and credit cards such as China UnionPay; and E-Wallets such as Alipay and WeChat Pay. All our solutions are accompanied by our industry leading fraud prevention, risk management, and complete business intelligence reporting and analytics. Currently, China UnionPay is the gateway card and payment method to the China market. By accepting CUP you are adding the ability to accept transactions by China consumers with RMB cards issued by the member banks of China UnionPay which includes all the majors. The WeCollect gateway will allow you to accept payments in RMB and allow you to receive settlement in the major currency of your designation. China UnionPay is the sole domestic card issuer in China, and is now the world’s largest card network by number of cards, and is expected to surpass Visa to become the largest network by transaction volume within the next year. If you want to access the Chinese consumer, having a CUP gateway is a necessity. To get started with China UnionPay contact us to learn more. Alipay is an e-wallet system developed by the Chinese e-commerce giant, Alibaba. Alipay has been the world's largest mobile and online payments platform since 2014. It currently has the largest market share in China with 400 million users and control of just under half of China's total online payment market in October 2016. WeChat Pay was launched by Tencent Holdings, a Chinese internet company, which also owns the leading social networking application WeChat. WeChat Pay allows users to perform mobile payments and send money between WeChat contacts. As one of the fastest growing and most popular payment methods in China, WeChat Pay has over 889 million monthly active users globally and USD 550 Billion transaction in 2016. As the e-commerce industry continues to boom, especially in China, the online payments space follows suit. With a population of almost 1.4 billion and 1.3 billion mobile users in China, there is a large market for mobile payments solutions to gain rapid adoption. The mobile payments market is currently dominated by CUP and two tech giants – Alibaba’s Alipay and Tencent’s WeChat payment, both popular options amongst Chinese consumers, with 49.2% and 20% market share respectively. 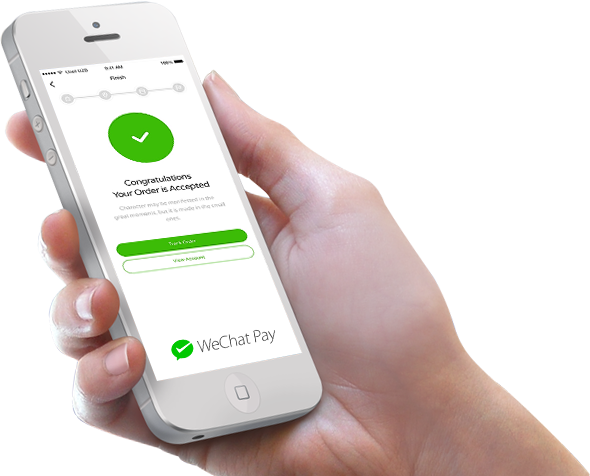 Quick Payment is one of WeCollect’s China payment solutions that supports both mobile and desktop interfaces. The user can authorize the online payment by using bank cards and a generated SMS code sent to their registered mobile phone. This easy to use solution is gaining popularity and it supports all browsers on web and mobile.